Check out her album review here, and as always, tell us what you think! 1 Pavement Ends Gets the album started, with an upbeat, get off your seat good ‘ol country song. 2 Pontoon There’s no need to introduce this next track. ‘Pontoon’ speaks for itself as the 2012 smash of the summer. I would list it as my favorite, but I’m disqualifying it from being my favorite because I am completely and totally biased towards it. Can ya blame me? 3 Sober The title is a little misleading on this track. Give it a listen, and maybe you’ll agree, that “when I die, I don’t wanna go sober”. 4 Front Porch Thing Just‘doin that front porch thing’. 5 Your Side of the Bed Paints a beautiful, yet sad picture of the loneliness that can exist in a relationship. 6 Leavin’ In Your Eyes The blending of their harmonies really shines through on this track. The female parts blend right into the male leads and make the four-parts sound like two. Shares the pain of seeing ‘leavin’ in the other person’s eyes. 7 Tornado Get ready to stomp along with this one! Being the title track of their new album, this song has to have a lot of oomph to it. You definitely don’t want to get in the way of the LBT Tornado. 8 On Fire Tonight This is the perfect song to jam along to at a Friday night bonfire. Feel good tune, with a groovy beat, this one we’ll put on reserve for next summer! 9 Can’t Go Back Spectacular intro. The vocals and the guitar part blend together so smoothly, your ears will surely thank you. ‘No, I don’t wanna be a witness to the end of you and me” rings the chorus in a somber tone, and the line, “how am I gonna make it better if I can’t go back” sends chills up my arms. “Some things you can’t go back to, cause you let them slip away”. Wow. The message and sound of this song make it my favorite track by far and I’m keeping it on repeat. 10 Self Made Gotta love country with a little rock from time to time. “Makin’ diamonds out of dust”. This song pulls you in from the start and the guitar riff at the end of the chorus keeps you there. This one’s gotta be a close number 2 in my book. 11 Night Owl The guys’ part is strong, yet sensetive (like every guy should be), am I right, ladies? The ladies’ part sprinkles on a sweet melody. 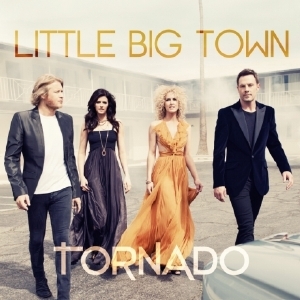 And that folks is the end of Little Big Town’s Tornado. Coral’s Country: “I’ve always been a strong supporter of Little Big Town. Ever since ‘A Little More You,’ their four-part harmony has pronounced a sound to be reckoned with. While I could never wrap my head around why they weren’t more “recognized” or “awarded,” they’ve always had true, true fans and their sound has yet to falter. These four voices are individually talented enough, but blend them together and it’s pure musical magic.